Comfrey is a plant of the Symphytum type, from the Boraginaceae (borage, forget-me) family. Mainly drawn to moist, it is native to Europe and Asia. Many varieties behave as well in colder as also in equatorial climates. Known since antiquity for its medicinal properties (healing). The Greek "Symphue" and later "Symphyton" means "I meet, I weld". The Romans call it "Consolida", the plant that repairs the bones. Closer to us, it's called "Consoude" in French and "Gemeiner Beinwell" in German. 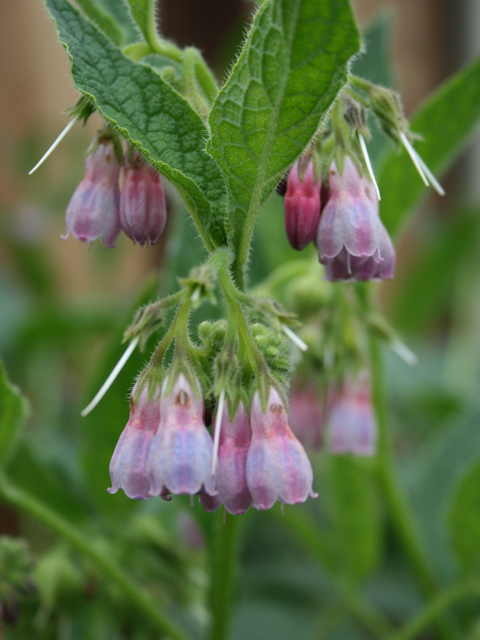 Comfrey was very popular in England in the 19th century and experienced an extraordinary boom after 1960 in the United States and elsewhere for its therapeutic and gardening use. Its fleshy roots are generally, according to age, brown or black on the outside and white inside. They can penetrate up to 2 meters deep and are thus able to draw essential nutrients for plant growth as the minerals present at this depth is inaccessible to most herbaceous plants. 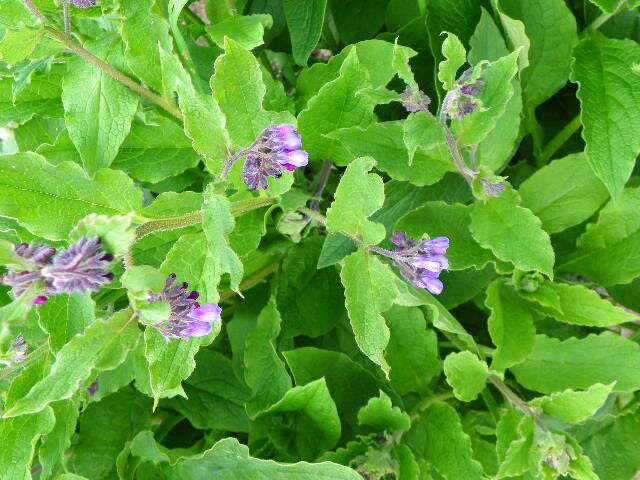 There are many comfrey varieties, approximately twenty. 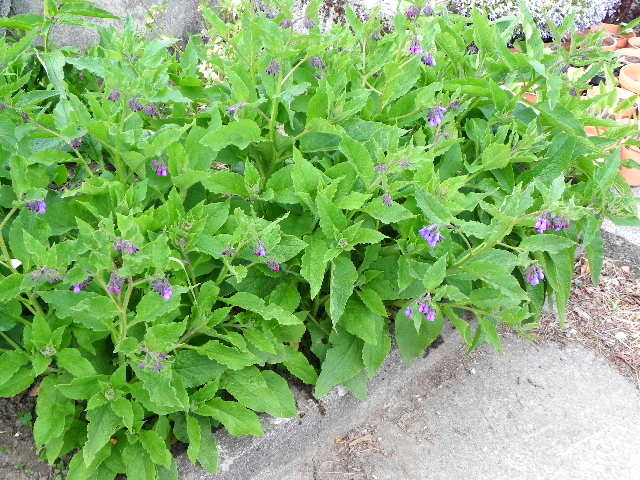 Besides officinale comfrey, there's tuberous comfrey, russian comfrey and various selections of Bocking comfrey. It's history is closely tied to England. From 1955, the H.D.R.A. (Henry Doubleday Research Association) in the person of Sir Lawrence D. Hills has conducted comparative studies in the Bocking station, Braintree Essex. After studying the different strains, it was found that the hybrid No. 14 proved ideal for use in the garden. This is the Bocking 14 we actually grow and offer. Numerous books and publications invite to discover the many virtues of comfrey as a fertilizer, flowering and fruiting accelerator. In addition to its contributions of NPK, comfrey offers many trace elements such as boron, which is very useful for flowering. This plant is a true gift of nature, rich in potassium, calcium, allantoin, vitamin B 12 as well as many natural hormones, but also very rich in trace elements and minerals.